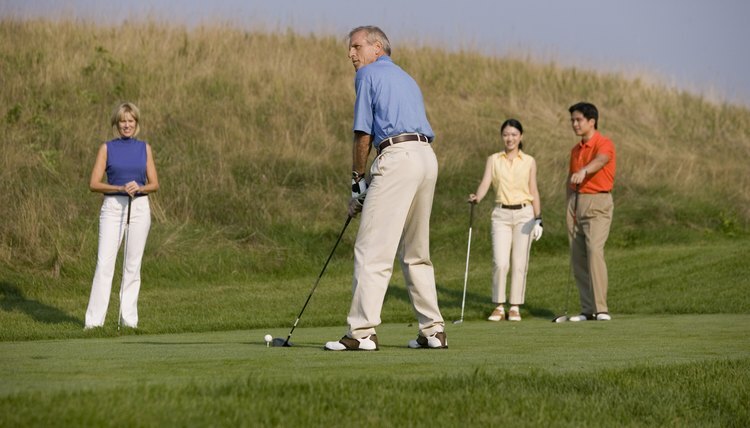 Playing golf is a great way to burn calories while having fun outdoors. In addition to being recreational, golf is also a way to burn some extra calories. Whether on the course, or on the driving range, golfers of all ages and body types can burn a varying number of calories simply by swinging away. According to NutriStrategy, one of the foremost authorities of health on the Internet, a 155-pound person will burn approximately 211 calories per hour on the driving range, compared to 245 for a 180-pound man and 279 per hour for a 205-pound man. Technically a form of golf, mini golf surprisingly also is a way to burn a few extra calories. For instance, a 155-pound person will burn approximately 211 calories per hour, compared to 245 for a 180-pound man and 279 per hour for a 205-pound man. Although it won't burn the same amount of calories as walking a round of 18, golfing with a cart will burn some extra calories. The average 155-pound golfer will burn an average of 246 calories per hour golfing with a cart, compared to 286 for a 180-pound golfer and 326 per hour for a 205-pound golfer. Walking the course, and pulling the clubs behind on a pulling device, is another way to burn plenty of calories. The average 155-pound golfer will burn an average of 303 calories per hour pulling clubs, compared to 351 for a 180-pound golfer and 400 per hour for a 205-pound golfer. Walking the course and carrying clubs is the best way to burn calories during a round of golf. The average 155-pound golfer will burn an average of 317 calories per hour carrying clubs, compared to 368 for a 180-pound golfer and 419 per hour for a 205-pound golfer.